Oberoi STEP 2018 is the three-year career based program offered by the renowned Oberoi Group. The candidates who are selected for the program will be based in a hotel of The Oberoi Group and undergo a practical training 5 days a week while the academic component i.e. the education is through distance learning. 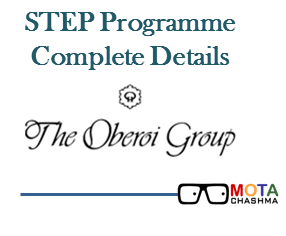 The online application process of Oberoi STEP Program 2018 will begin from Feb-March 2018. The selection of the STEP program is based on personal Interviews to be held in various cities across India from 27 April to 3 May 2018. There is no written examination for admission in STEP Program. The city-wise interview dates are given below on this page. It involves training in Western and Indian kitchens and specialist sections such as bakery, pastry and cold kitchen. Three Years on the job training in Hotel. 6 Days a week in Hotel (Full Time) for 3 years. Degree in Bachelor of Tourism Studies from IGNOU Indira Gandhi National Open University. The application process for these programmes begins in February each year. The programme commences in August. Age: Candidates above 18 years and below 20 years of age as on 15 August 2018, are eligible to apply. Academic Qualification: The candidate should have cleared Class 12 as on July 1 of the year of the commencement of the programme, from a board recognized by the Indira Gandhi National Open University, India. Candidate should have secured 61% marks or above, in English in Class 10. The equivalent in CBSE is a B2 Grade or a 7 Grade Point. Candidate should have obtained 51% marks or above, in English in Class 10. The equivalent in CBSE is a C1 Grade or a 6 Grade Point. Candidate can fill the STEP 2018 Application Form through online mode only. There is no written examination for admission in STEP Program as well as no application charges. The selection of the STEP program is based on personal Interviews. Candidates can click on the following link to fill the application form. Candidates can apply online Only at the official website of Oberoi’s Group. There is no pen and paper form. While filling the Application Form, candidates will be given the option to select the city, date and time for their selection process. Candidates have to take a printout of their completed application form. Bring this application form along with one passport size photograph on the date of your selection process. One printout of their application forms along with one passport-size photograph. One copy of their class 10 certificate. If the candidate's certificate does not mention their date of birth, one copy of their birth certificate will be required. One copy of their class 12 certificate. All the documents should be verified as authentic. On the selection day, the candidates will have to go for one of the Programmes. Candidates will be divided into groups of 15-20 participant. Thereafter, many rounds of activities and questionnaires will be conducted. The evaluator checks the candidates grooming, poise and spoken English. Short-listed candidates from Round 1 are taken to another round of activities on the same day including a one-on-one meeting with a panel comprising the faculty. The evaluator gets to know them better and checks their aptitude for hospitality. This might be conducted on a different day and city than the above two rounds. Results are sent by email or post. The Programme will commence in August. About Oberoi Group: The Oberoi Group was founded in 1934 and presently operates 30 Hotels under the luxury “Oberoi Hotels and Resorts” brand and the 5-star “Trident Hotels” in India and Abroad. Accommodation: The hotel will provide the facility of accommodation on a shared basis. Meals and uniforms: On duty Uniforms and meals will be given to the candidates. Dedicated weekly day for study. The very first advantage of joining STEP is the possibility of a future career with The Oberoi Group. Candidates can be offered a job as an Operations Assistant at any of the hotels. These positions and jobs depend on the performance of the programme and availability of a suitable vacancy. Candidates can also seek admission into our two-year post-graduate management training programme at The Oberoi Centre of Learning and Development (OCLD). The management training programmes offered by OCLD are considered among the best in Asia and a benchmark for international excellence within the hotel industry.